Every year, 2.8 million seniors are treated in emergency departments for fall injuries. Our fall prevention tips will ensure you’re not one of them. The bathroom is the most common site of home accidents. 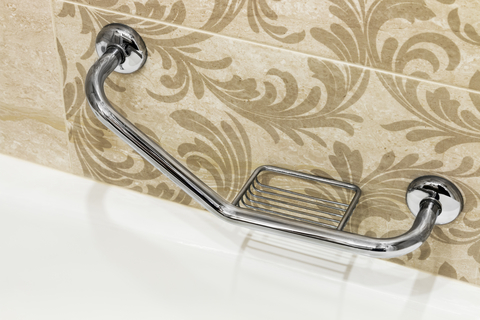 Fall prevention measures you can take include bars in the bathtub and shower areas. The statistics might surprise you: 1 in 4 people aged 65 and older experience at least one fall each year. It’s thought that around 1 in 5 of these falls results in a serious injury, such as a fracture or head injury. Simple fall prevention tactics, however, can significantly reduce the risk of falls. For seniors, fall prevention isn’t necessarily a straightforward matter. Natural age-related changes increase the risk for falls. For instance, presbyopia, which affects the eye’s ability to focus on nearby objects, sets in during your middle to late 40s, and then worsens. Presbyopia results in poor vision that can lead older adults to reduce their physical activity levels—which in turn reduces strength in their limbs and increases the risk of a fall. Aging also can affect the strength of bones, and if you have the bone-thinning disease osteoporosis, you’re more likely to fracture a bone in a fall. The American Geriatrics Society recommends that older adults undergo a “fall risk assessment” test to identify risk factors. The assessment should include a medication review to see whether the patient can reduce or substitute any drugs that might contribute to a fall by causing dizziness. Seniors also should report any fall—no matter how minor—to their doctor and ask for a referral to a physical therapist, who can carry out a safety evaluation on your home and recommend fall prevention measures. 1. Eradicate tripping hazards. Eliminating clutter that could represent a tripping hazard should be your first step. A study presented at the annual meeting of the American Society of Anesthesiologists in October 2017 found that the most common reason for hip fracture in the 544 participants was tripping over an obstacle. For an indoor fall, throw rugs were the most common culprit, so one of the best fall prevention measures you can take is to get rid of throw rugs, or tape them down so they don’t slide as you walk on them. Also, make sure that lamp and power cords don’t run across areas you frequently walk through. And position coffee tables in corners or against walls so that you don’t have to detour around them. If your stairs are carpeted, a crucial fall prevention measure is to ensure that the carpet (or any other stair covering) is properly attached to each tread so that it doesn’t slip under your feet as you ascend and descend the stairs. If your stairs don’t have a handrail, have one installed. 2. Light your home adequately. It’s vital to ensure that your home is adequately lit for fall prevention, so install light switches at the bottom and top of flights of stairs. If this is not possible, consider hanging a battery-operated emergency light at the top or bottom as necessary. Designed to be used in power outages, these simple press-on lights can be purchased at home improvement stores, and it’s worth situating several around your home. Use plug-in nightlights to light the route to the bathroom at night. 3. Avoid bathroom slips. Statistics suggest that more home accidents occur in the bathroom than in any other room in the house, and with the typical combination of hard tile floors and water spillage, it isn’t hard to see why. As far as you can, avoid splashing water on the floor, and use non-skid mats in and outside the bathtub and/or shower. Other bathroom fall prevention tactics include installing grab bars to provide additional support in the shower/tub area and next to the toilet. While you can opt for easily installed suction bars, it’s best to opt for ones that screw into the wall, as suction bars may not support your weight. Similarly, if you use a tension-mounted shower curtain rail, replace it with one that screws into the wall, so that if you lose your balance and grab at the shower curtain the rod won’t spring loose.Another good precaution is to mount a waterproof phone somewhere that’s easily accessible should you fall when exiting the shower/tub. 4. Consider your kitchen layout. If you are able to, have wall cabinets lowered so that you don’t have to use a step to access them. Or move frequently used items to the floor cabinets. You also may find a “grabber” tool handy for accessing things on higher shelves. 5. Get regular eye exams. Eye diseases such as age-related macular degeneration and glaucoma progress so slowly that they can severely diminish your central or peripheral vision without you realizing. This is a particular issue for people who have one good eye, since the good eye tends to compensate for any vision discrepancy in the affected eye. Other eye conditions that are common in seniors—such as diabetic retinopathy and cataracts—also can impact vision. Annual eye exams should be one of your fall prevention strategies, since they are the best method of detecting, monitoring, and treating these conditions. 6. Use a medical alert system. Consider enrolling in a medical alert system or “lifeline.” For a monthly fee, these services provide you with an emergency button to be worn around your neck or on a wrist strap. If you press the button in an emergency, a signal is sent to a monitoring station and a family member or the emergency services will be alerted. In case of any emergencies, write the name and contact number of your doctor and emergency contact (along with details of any allergies and medications you take) on a sticky and attach it somewhere visible, such as on the refrigerator. age related macular degeneration, aging, allergies, bone, bone thinning, cataracts, coffee, diabetic, diabetic retinopathy, dizziness, elderly health, elderly health care, elderly health care issues, eye conditions, eye diseases, fall prevention, glaucoma, head injury, health, health care issues, hip fracture, macular degeneration, osteoporosis, physical activity, presbyopia, report, strength.